Tired of unreliable service and shady repair shops? We were too. That’s why we struck out on our own and founded Paris Autobarn, a home town auto-repair shop with a green edge. Never be kept in the dark again. Using advanced techniques and cutting edge diagnostics, we’ll let you know what’s going on with your vehicle. Any recommended repairs are explained thoroughly, and we’ll be there to answer your questions in person, over the phone, or online. We know what we’re doing. We are ASE certified, have over 30 years combined experience, and have received factory training from Honda & Subaru in the past. Our shop is fully equipped with all the latest diagnostic equipment, tools, and reference materials. We promise to provide exceptional value, outstanding service, and a green twist. 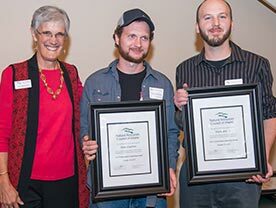 We are a supporting business member of the Maine Organic Farmers & Gardeners Association, MOFGA. We work closely with the Center for an Ecology-Based Economy (CEBE) and we’re a part of their Community BikeShare program. We use the most sustainable practices currently available to the automotive service industry and are always looking for new and innovative ways to protect our environment. Help us become the greenest automotive repair facility in the area! “Paris Autobarn is an innovative small business owned by Tony Giambro. The business promises to provide exceptional value, outstanding service, and a green twist. He uses the most sustainable practices currently available to the automotive service industry and is always looking for new and innovative ways to protect our environment. His goal is to become the most eco-friendly automotive repair facility in the area while doing their part to reduce the effects of climate change. Paris Autobarn boosts a pair of ultra-efficient air-to-air heat pumps; roof top solar array; LED lighting; recycling the majority of their waste, including used engine oil, transmission fluid, and antifreeze; a process for washing parts in a non-toxic solution; using a non-toxic, biodegradable rust penetrant and lubricant; using sustainable or ecologically friendly paper; they even offer bicycles to use while customers are waiting for their cars! The business is continuing to grow and they now sell electric and hybrid vehicles. 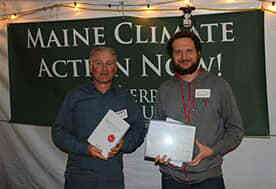 Tony Giambro from Paris Autobarn LLC receiving the Sierra Club Maine’s 2016 Business Leaders for the Environment Award, along with friend of the company, Fred Garbo (left) of Garbo-Kane Integrated Solar Builders. The Maine Department of Environmental Protection and Gov. 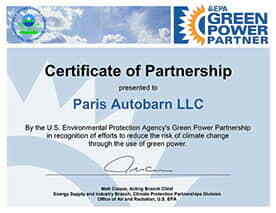 Paul LePage selected Paris Autobarn to receive an award for environmental excellence. 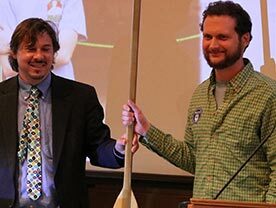 The award reflects “extraordinary efforts to protect and improve Maine’s environment,” according to a media release from the governor’s office. 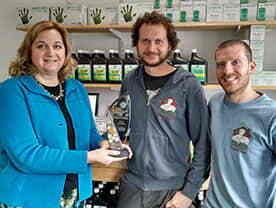 Leslie Anderson of Maine DEP presents the Governor’s Environmental Excellence award to Paris Autobarn on October 16, 2015. We are not a typical automotive repair business and we are not typical mechanics— we know that. We run our shop in a sustainable manner and we’re not afraid to stand up for what’s right. Environmental protection and social justice are very important to our company and our employees, and we actively advocate for both. Because of this, we’ve attracted quite a bit of attention from the media, both as a business and as members of our community. Below is a sampling of some articles and videos with mentions of Paris Autobarn, its owners and employees.